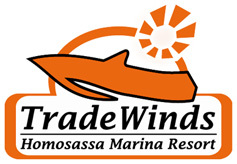 The community of TradeWinds Homosassa Marina Resort now has a number of beautiful, fully furnished homes available for rent. Boat slips can be added to your reservation. all rates are excluding 6% sales and 5% transient tax. For all periods of rental, a refundable security deposit of $ 500.00 is applicable. The minimum stay in Scalloping Season is 3 nights. For holiday weekends (4th of July and Labor Day) the minimum stay is 4 nights. Pets: $ 25.00/night, $ 100.00/week, $ 250.00/month (+6% sales and 5% tourist tax). Boat slips: $ 35.00/night, $175.00/week, $350.00/month (+6% sales tax). Rates as presented are per night. A down payment of 25% of the total amount is due within 7 business days after receipt of the booking confirmation. Reservations are not valid until the requested down payment is received. All reservations must be pre-paid in full 30 days prior to arrival date. Pre-payment can be made cash, by cashier's check, by personal check or by electronic transfer to our bank account. Payment by credit card is also possible; a 3.50% fee will be added to your invoice. If full payment is not received 30 days prior to your arrival, we will consider your reservation cancelled and we will have the right to rebook this property. A cancellation fee of $ 500.00 will be deducted from your down payment. If you cancel for any reason your reservation until 30 days before arrival we will charge you a $ 500.00 cancellation fee. If you cancel for any reason your reservation between 30 days and the day of arrival or No-Show on day of arrival we charge you for 100% of the rental amount. 'We've been coming to Homosassa for my highschool buddies and I annual scalloping event. We found the Tradewinds and Frans about 5 years ago. We've been coming back every year since.